All Sisterhood members are welcome to join us at our general meetings. Not a member? Join now! Resistance comes in many forms. A clandestine group of journalists, scholars, and community leaders in the Warsaw Ghetto defied the Nazis with the ultimate weapon the truth and risked everything so that their archive would survive the war, even if they did not. Now, for the first time, their story is told in the documentary featuring the voices of three-time Academy Award® nominee Joan Allen and Academy Award® winner Adrien Brody. 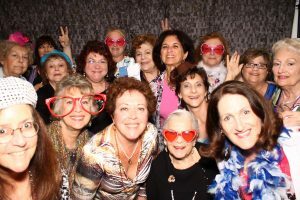 To see more photos and what we are doing please visit our Facebook page, Temple Beth Sholom Sisterhood of OC OR come and join us for our membership brunch, it’s a great way to meet us!! Become a member today!! Join Temple Beth Sholom Sisterhood and be a part of our warm and dynamic group. Learn what Sisterhood does! For additional information regarding Sisterhood, contact Lori Glasky via email tbsshpres@gmail.com or email us at sisterhood@tbsoc.com. SISTERHOOD MISSION STATEMENT:We, the women of Temple Beth Sholom Sisterhood, are dedicated to providing women with a voice and presence within our congregation. We strive to enrich Jewish living, establish lasting friendships, accomplish tikkun olam, and support the ideals of Reform Judaism. Through social interaction, leadership training, education and actions, we enhance our communal life and spiritual growth. Sisterhood Gift Shop – WE ARE HERE TO SERVE YOU!We are OPEN for business. Through her longstanding relationship with many popular Judaica vendors, including Michael Aram and Gary Rosenthal, our gift shop manager, Sarah Schweitz can order a wide variety of items just for you! Purchase a beautiful tallit from Israel for the Bar/Bat Mitzvah. How about an egalitarian ketubah (marriage certificate) for the bride and groom? If you have something in mind, or need a gift for an upcoming event, contact Sarah at (714) 282-2258 or (714) 538-6006 to place your order. Need to send a thank you, get well or “just thinking about you” card? Honor and remember a loved one, friend, or family member with a personalized tribute. Each tribute card represents a donation to the YES Fund, Sisterhood’s philanthropic fund. Each tribute will be personalized with your own special message or a message can be selected for you. Minimum tribute donation is $5 per card. We have a great selection of gorgeous cards. Click here to view samples of the tribute cards. For more information or to have a card sent, contact Lisa Litman at 714 974-7779 or bigfoottl@aol.com. Sisters attending Gala in honor of Rabbi Cohen! 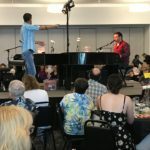 Dueling Pianos at TBS. We know how to throw a great party! Community Partnership with TBS Sisterhood: Grocery chains and stores will donate a percentage of your purchases to Temple Beth Sholom Sisterhood every time you shop. How much will this cost you? ABSOLUTELY NOTHING! Ralph club card members… Do you know that Ralph’s club card is now a REWARDS card? On September 1st of each year, you need to re-register your Ralphs card so that we get the credit. You can register it online at www.ralphs.com or take your completed Ralphs letter 2015-2016 to your cashier the next time you shop at Ralphs. ( See escrip flyer 2015-2016R for more information). It only takes a few minutes! Credit card sign-ups can be done personally and privately by you at www.escrip.com. Our Group Account name is Temple Beth Sholom Sisterhood and our account number is 136559178. Complete the sign-up process by entering your name, address and phone number. Then enter your credit/debit cards for any of the additional restaurants and groceries where you shop. It’s completely safe and private. 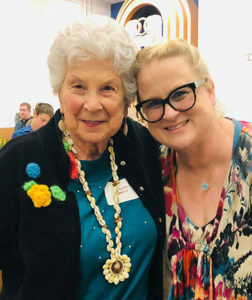 MORE FROM SISTERHOOD: Great Programming: Mah Jongg, Chanukah Celebration, Guest Speakers, Book Reviews, Cultural Events, Crocheting for Knots of Love and many more.